Green Sleep is a manufacturer of high-quality, luxury natural and organic rubber mattresses. With attention to healthy, natural materials, Green Sleep endeavors to create the most comfortable sleeping environment possible. 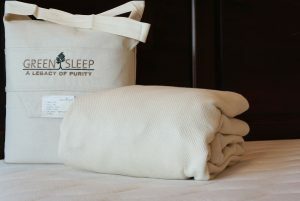 The Natural Sleep Store carries a selection of Green Sleep organic mattresses, foundations and sleep accessories. The Green Sleep natural rubber mattresses, the Hevea Sogno, Hevea Vimala and Hevel Dolcezza, are made of separate layers of natural rubber encased in a pure grow wool, silk, and a plush organic cotton velour zip off cover. The natural rubber comes in soft, medium, and firm. Each Green Sleep Organic Mattress model has a different arrangement of natural latex layers and firmness levels. 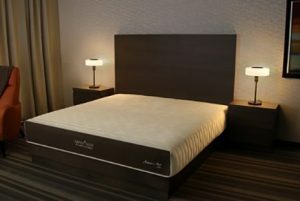 For some of the layers, the firmness level is customizable as well as being customizable for each of the two sleep zones (queen and king only). 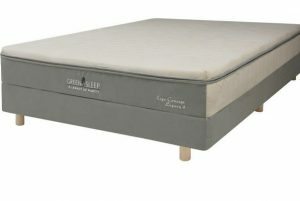 The casing of the Green Sleep organic mattress is an organic cotton velour quilted to pure wool. 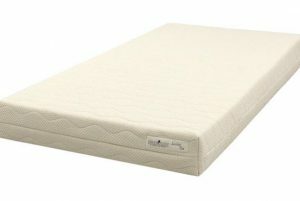 The Green Sleep Natures Nest Niu is a unique pocket coil mattress that allows you to change the firmness level of each side of the mattress. Made from individually wrapped coils, organic cotton, wool, coir, and Green Sleep’s organic cotton velour, this mattress is sure to please. Purchase mattresses with or without a unique Green Sleep European dowel-style foundation. The wood slats and dowels are flexible, allowing for softer support. The foundations are made without glue and finished with the organic cotton velour to match the Green Sleep line of organic mattresses. 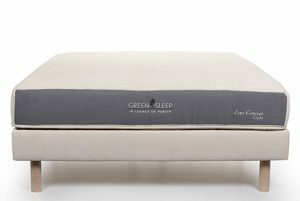 Green Sleep offers a luxurious mattress topper made similar to the mattresses with a core of natural rubber and covered with Pure Wool and organic cotton velour. Choose this topper to soften and enhance your Green Sleep mattress or to add a Green Sleep feel to a different mattress. This is our nicest organic mattress topper. 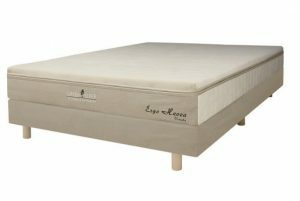 $2,929.00 – $7,567.00 The Ergo 8 Natural Rubber Mattress features 8 inches of natural latex enclosed in organic cotton and wool. The Ergo 8 allows for individual customization on both the right and left side of the bed as well as the head, middle and foot sections of the bed. 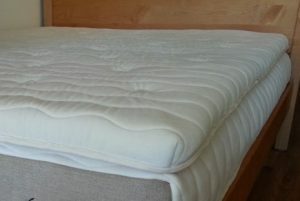 A firm mattress constructed of 6.5 inches of natural latex encased in organic cotton velour and wool. Three individually wrapped layers of natural rubber, with the middle layer being customizable. All the luxury of Green Sleep at a fraction of the cost. Free Shipping plus two FREE standard Ergo 6500 (shredded rubber) pillow(s). $2,049.00 – $5,937.00 All the luxury of Green Sleep, yet remarkably affordable! A firm natural rubber mattress with 6.5 inches of natural latex. The Niu is a unique organic pocket coil mattress that allows you to adjust your comfort level by flipping the innerspring core, inside of the zippered cover. The core of the mattress is organic cotton wrapped pocket coils covered in three inches of natural rubber, Texel virgin wool, and finished in the signature Green Sleep organic cotton velour. FREE SHIPPING with all Green Sleep mattresses! 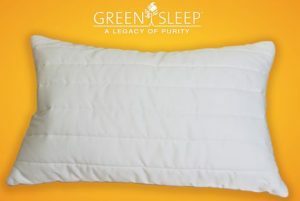 Read our blog post about our visit with Green Sleep and also our Green Sleep blog post about Green Sleep’s purity standards. The Green Sleep mattress was mentioned in Time magazine. Click here to read the article. Green Sleep is a company based on more than 30 years of scientific research. 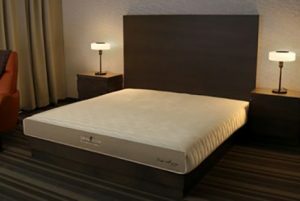 It was the desire of company founder Georges Lambrecht to create a mattress that is healthy and comfortable, and disturbs restful, rejuvenating sleep as little as possible. Created in Belgium, Green Sleep now has manufacturing in Canada, serving North America. Green Sleep-A Legacy of Purity.